On Friday October 14, 2011, a record release party for the new Río De Sangre album was held at the home of John and Tammy O'Connor. In attendance were Florentine Opera Company General Director William Florescu, conductor Joseph Rescigno, soprano Kerry Walsh, tenor John Duykers, translator Alicia Partnoy and composer Don Davis, as well as other notable guests. View the gallery here! Listen to Act 1, Scene 2 here! Read the 2010 Thirdcoast Digest review of the Florentine Opera performance here. 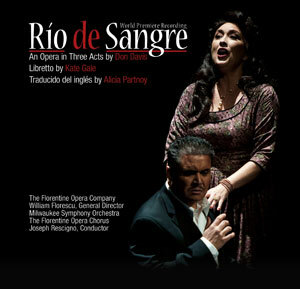 Albany Records is proud to announce the release of Río de Sangre, an opera with music by Don Davis and libretto by Kate Gale. This recording was made during the world premiere performances by The Florentine Opera Company and Chorus and the Milwaukee Symphony Orchestra conducted by Joseph Rescigno. Opera and politics have been linked, both directly and indirectly, since the genre first became popular in the 17th century. Today, many composers and librettists choose to use fictional characters and situations to offer a general commentary on political and historical events, aiming for a degree of universality. That is the approach that composer Don Davis and librettist Kate Gale chose to take with their opera Río de Sangre. The story is one that has been told many times–the idealist who becomes the leader of his people only to find that those he trusts most, through their own greed and ambition, are the architects of his eventual downfall. Don Davis has enjoyed a successful and widely varied musical career as a composer of contemporary orchestral and chamber works and music for film and television. His work has featured in the Monday Evening Concerts at the Los Angeles County Museum of Art and has been performed by such notable ensembles as The California E.A.R. Unit, The Los Angeles Master Chorale, the Arditi Quartet, the Debussy Trio, and the Rundfunk Kammer Orchester of Amsterdam, among others. Mr. Davis is perhaps best known in the world of film and television music for his work on the Matrix trilogy of movies (The Matrix, The Matrix Reloaded, and The Matrix Revolutions). Dr. Kate Gale is Managing Editor of Red Hen Press, Editor of The Los Angeles Review, and President of the American Composers Forum, L.A. She teaches in the Low Residency MFA Program at the University of Nebraska in Poetry, Fiction, and Creative Non-Fiction. She serves on the boards of A Room of Her Own Foundation and the Poetry Society of America. Dr. Gale is the author of five books of poetry and six librettos. She has published numerous articles and works of poetry and fiction in various literary journals and magazines including Gargoyle, The Brownstone Review, and Paterson Literary Review.